Monochromatic dressing is always more interesting when textures and prints are involved, especially when it’s a neutral color you’re sporting. It’s easier to get away with so many things at play because they all just magically jive. Having said this, don’t be afraid to break the monotony even further by adding a few accent colors through your accessories. Surprise me, why don’t you? Take a look at my electric blue shoes and stark white bag, for example. They instantly made my outfit a tad bit more playful and fresh! Grayscale, no more! I think the color of the heels made all the difference on this outfit. I like it very much! You are so good in prints on prints. I love this outfit! Great outfit, Perfection!! Lovin your bag and shoes. There goes barbie shoes again lol and oooohhhh i love your baag!! 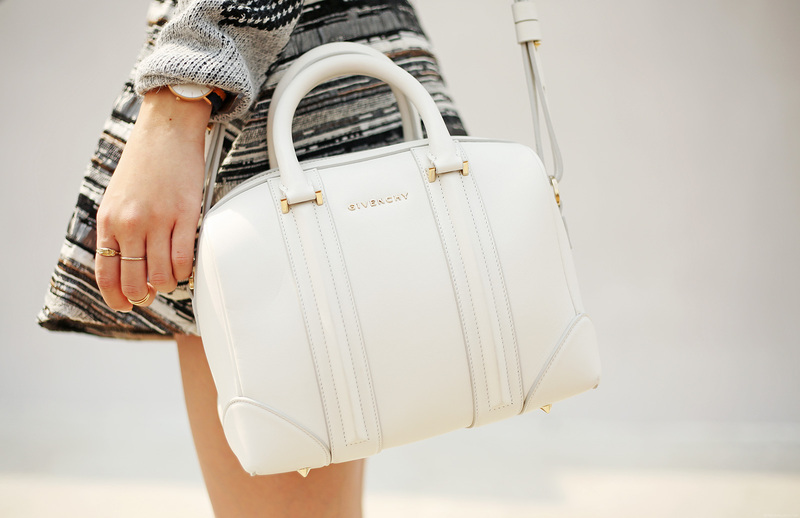 I don’t know why but I’m a sucker for baggy sling bags <3 Haha and you're like the queen of print on print! Love how you played with the patterns, they go well together and it just… works! Haha I'm running out of things and I keep telling the same thing over and over again haha. Oh well! So pretty! ♥ Exemplary as ever! Did you change your camera? I noticed the images are different from your previous posts. You look beautiful! Such a chic look! Wow, what a gorgeous look. Lovely legs. I really like how you broke the gray scale tone of this outfit with those shoes Cams! Great tip by the way. 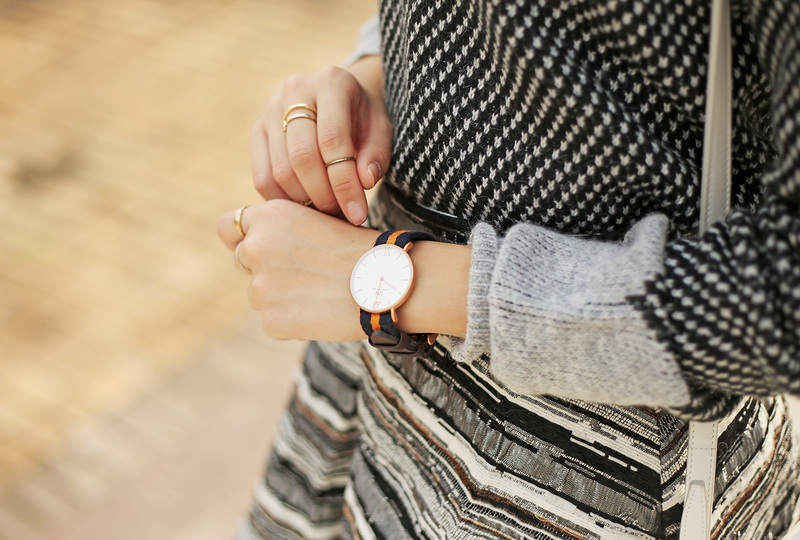 Great combinations, especially the sweater and the skirt. You’re right who says it just has to be in grayscale. Awesome post! Wow the pop of color from your shoes is so nice!! Yes…the blue shoe are what really sets this off ! Perfect ! Thanks April! :) In love with them too! You look so beautiful! But I don’t know about the shoes, I dont really like it though. Ooh and I just want to share this experience with you. I posted an ootd one time on Instagram and a friend of mine called me " a mini Camille Co" and I was so surprised and honored (yes honored haha!!!) to have been compared to you! Wow hahaha. I'll never be as fab as you are though!! haha! 'Yun lang!!! Hahaha thought I'd let you know!! Hihi! Mini lucrezia :) Thanks Yana! Don’t say that! You’re fab!! awesome camille , love the prints in this look , hey you inspired me soo much !! Oh! I always fall in love with your print on print outfit. Before I was so hesitant to score an outfit like that but with your influence I felt confident, and I just felt sorry for those who cAnt get what I’m trying to impose, like it’s fine as long as you can carry yourself. Thank you for sharing your style with us! My pleasure! I’m glad you’re into print on print now too!